The Straw & Hide bed is created by right clicking with a Large Raw Hide on two adjacent Thatch blocks while standing at what will become the foot of the bed and facing towards the head of the bed. Straw & Hide beds are used by right clicking on them at night or during a thunderstorm. Attempting to use a bed at any other time will result in a "You can only sleep at night" chat message. 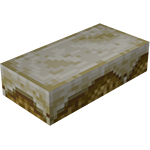 Unlike the vanilla bed, straw & hide beds do not set the time to dawn; they only reset the player's spawn. To alert the player of this difference, getting into the bed will result in a chat message of "This bed is too uncomfortable to fall asleep." Breaking the bed will drop the thatch blocks and raw hide used to create it. Added the Straw & Hide Bed. If the language is set to Canadian English and the player gets into a straw & hide bed, you get a chat message that says "This bed is too uncomfortable to sleep in, eh?". This is a joke on stereotypical Canadian use of the word "eh." First official screenshot of a Straw & Hide Bed released by Dunkleosteus on his twitter account (@TFC_Dunk). 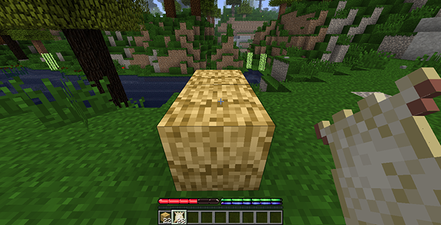 A screenshot of how the player must be positioned and facing to create a Straw & Hide Bed. This page was last modified on 8 November 2014, at 06:11.